Welcome to a new week. 1. Stock market movers -- Applied Materials, Volkswagen, HSBC: Monday has barely begun but some stocks are swinging like crazy. Shares in Applied Materials (AMAT) are falling by about 8% premarket after the company canceled its planned merger with Tokyo Electron (TOELY). The company, which makes materials used in semiconductors and other tech products, said the U.S. Department of Justice raised concerns about a loss of competition in the market. Shares in Volkswagen (VLKPY) are rising by about 4% in Germany after the company's chairman resigned from his post. There had been a power struggle at the top of the company and the chairman had tried in vain to oust the automaker's CEO, Martin Winterkorn. Shares in HSBC (HSBC) are up another 3%, building on a Friday surge. Last week, the bank warned it was looking to move its headquarters outside the U.K. Investors are also bidding shares higher after the Sunday Times reported HSBC may sell its British retail bank for roughly £20 billion ($30 billion). 2. Earnings: The most prominent company reporting quarterly results today is Apple (AAPL). The tech giant will report after the close. 3. 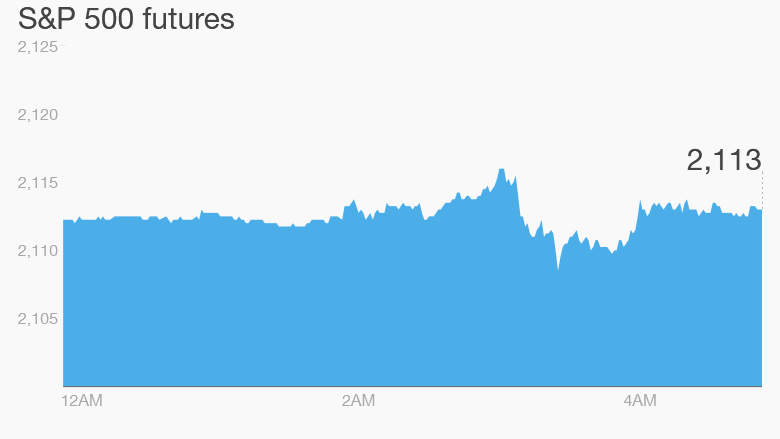 Stock market check: U.S. stock futures are not making any major moves ahead of the open. But if the indexes push up, they could very well hit new record highs. Wall Street was an exciting place last week with the S&P 500 and Nasdaq both breaking records. On Friday, the Dow Jones industrial average gained 21 points, while the S&P 500 rose 0.2% and the Nasdaq closed with a 0.7% gain. 4. International stock market overview: Most European markets are dipping in early trading. Asian markets ended with mixed results, but the Shanghai Composite index stood out from the pack with a stunning 3% surge. The index is now at its highest level in seven years after rising by 40% since the start of 2015.